I am now nine weeks post my last relaxer touch up and my stretch has been going well thus far. Minimal shedding and very little to no breakage. Also, I've been able to keep my hair moisturized including my new growth which acts like a desert floor and can't seem to get enough moisture. 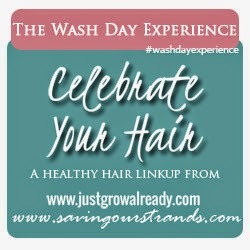 For this wash day, I opted to co-wash with As I Am since I shampooed last week. To switch things up a bit I did a black tea rinse versus my normal green tea. The black tea was a free sample I got and because I don't care for the taste of black tea I saved it for a rinse. 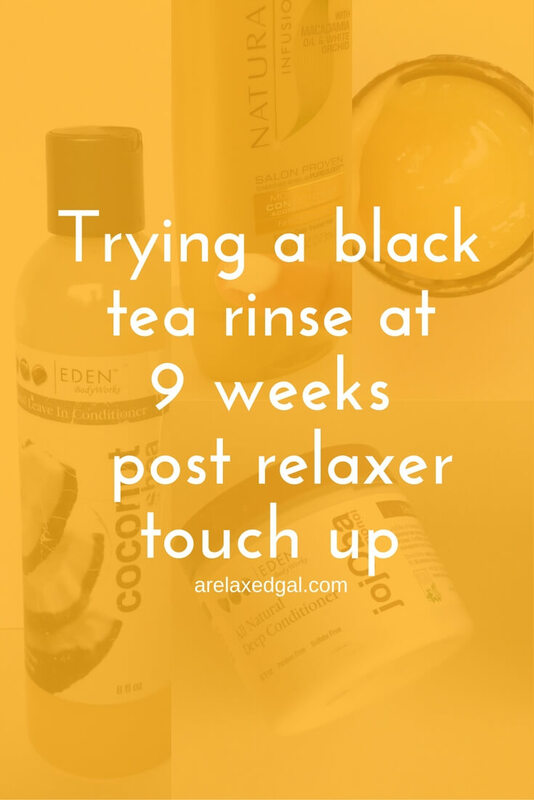 I had read that black tea tends to dry out the hair more than other teas so I used less and tried (key word tried) to pump up the moisture with the products I used. I sectioned my hair into four sections, one on each side and two in the back. Using sunflower oil I fully detangled each section. With my hair in four sections, I applied the Eden BodyWorks Jojoba Monoi Deep Conditioner, then let it sit with my Hot Head Conditioning Cap for 40 minutes. For this, I used As I Am Cleansing Pudding. My hair didn't feel stripped after rinsing like it did the first time I used the cleansing pudding. As mentioned above I used black tea instead of green tea. I had read that black tea is more drying so I wanted to make sure I also used a rinse out conditioner. I got my Suave Natural Infusions Conditioner and realized that I had pulled the anti-breakage conditioner and not the moisturizing one. Then I made the mistake of using the anti-breakage conditioner instead of getting the other one. As expected, it did nothing good for my hair. My hair felt on the dry side so I loaded up on the Eden BodyWorks Coconut Shea leave-in and sunflower oil. After air drying for an hour, I sat under my hooded dryer for 45 minutes getting my hair about 90% dry. Before cross-wrapping I put more leave-in on and used coconut oil to seal. In the morning my hair still felt dry, I had some strands sticking together and a few tangles. Over the next couple of days my moisture level got better and the tangles lessened. I attribute this to daily am and pm moisturizing and sealing. What's your favorite tea for tea rinses? I haven't tried black tea, do you prefer it over green tea? Though I've only tried black tea once, I think my preference is green tea. I didn't care for how my hair felt after the black tea rinse. Black tea made my hair feel protein overloaded. I've never tried green. 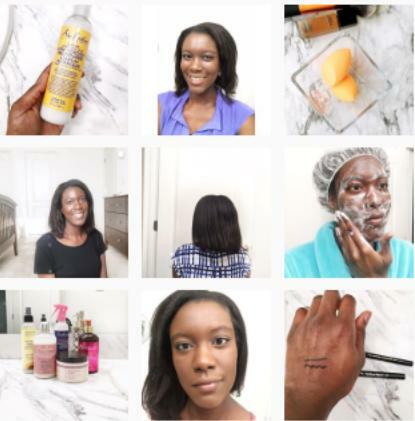 Glad you were able to get the moisture back up in your hair by moisturizing and sealing regularly! I probably would have had to co-wash my hair to fix it. I have found black tea to be more drying than green tea as well. But I would still use it because I think it does a better job on my shedding than green tea does. 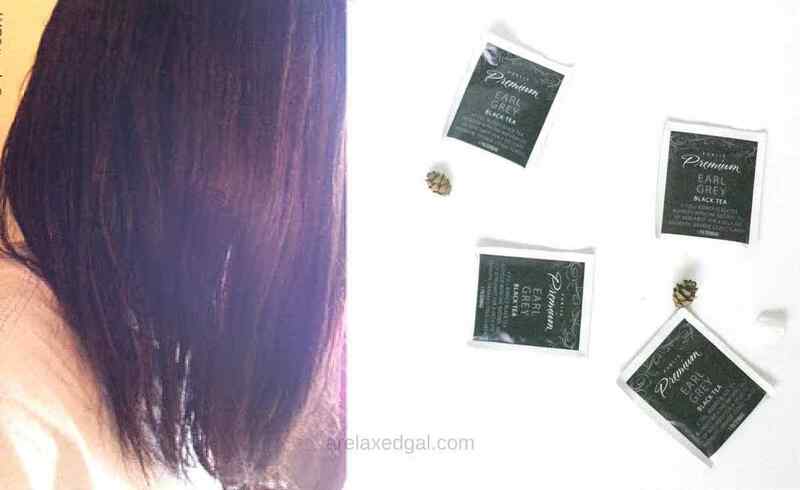 Do you put your deep conditioner in your hair at the same time as your tea rinse? Hi Melanie! I actually deep condition as my pre-poo, but when I do a tea rinse I wring out the excess liquid and then put my rinse out conditioner on top. So glad, your moisture levels are back up. I'm also experiencing some dryness and think i need to incorporate mid week cowashing. Mid-week co-washing was my next option. I was hoping my moisture levels would get better as I was out of town for a couple of days and didn't want to have to do an emergency co-wash. I hope co-washing helps the dryness. What are the temps in your area Leah & Tomi? It's been swinging between the low 80s and high 60s where I live in NC. I definitely prefer green to black tea. Maybe you can try one green tea bag and one black tea bag next time. No matter how I've wrapped my hair, it's never looked as smooth and frizz free as yours! What's your secret? Thanks for the idea KLP. I may try mixing the two teas. To be honest, I'm not sure what my secret is for smooth and frizz-free wrapping results. I typically use coconut oil on my ends before wrapping my hair and the scarf is a satin one. Great wash day and so glad your moisture game is back on point. Can I do a tea rinse the same day I relax my hair?